We've got three boards up in Otaki saying fibre will be ready October 2017, March 2018 and June 2018. We're a small town so I'd expect them to be the same, but never mind. I receive an email on 12 July to say it's now available in my street, so I place my order, setup the scope meeting on Wednesday 18th AM and the install for Monday 23rd AM. I receive confirmation and I sit back and relax. By Tuesday evening I've received four 'contacts' with two telling me the appointment is AM and two PM. In the evening I receive a text from a Chorus fella confirming PM which isn't what I ordered but I have the day off so I let it slide. Wednesday PM comes and they get cracking at 1:30pm. The install is not difficult they say, cabling from the ETP to ONT where I want it is easy they say. A couple of hours later they come in to say they cant get the cable down to the house as the last 'hole' is 100m up the street. They need something more powerful to blow it down so will come back on Saturday with better equipment. Come Saturday and they are out there again, digging up the grass, but a much bigger hole this time and a couple of hours later I notice they are gone. There is still no ETP on the side of the house and still only the copper in the tube into the house. I assume they will take care of it on Monday. So now it's 3pm on Monday. Do you think they have turned up ? Do you think there has been any contact ? So I contact Chorus on Twitter, who offered to help last week with the AM/PM fiasco and now I receive an email stating it's been rescheduled to 23 September, two months away ! My pick would be the physical network build has a fault they've uncovered and requires remediation, hence the long time frame. The companies doing the installs aren't the ones who do the network build, so if they've found a fault they need to go through the process of remedial work being done by the original contractor. I came home today to find a 4m2 area of my lawn dug up around the existing copper access to under the house. No notification or contact from Chorus so maybe it was a massive mole. That is disgusting. Surely they have no right to do this without communicating their intentions to you. I'm pretty sure I read in another thread they can do 'basic' stuff like this without explicit consent as long as they 'put it right' afterwards. Grass does grow back after all. If it gets me my fibre then it's not a problem, I would just have liked some notice they would be on the property and they would be digging the lawn up that's all, especially after I took the day off on Monday and they didn't turn up at all. At least its grass!! Here's a street in my neighbourhood which is looking pretty shoddy right now. One can only hope they are coming back to use concrete rather than the mix and matching here. It makes me realise how backward our councils are. If you go somewhere like the gold coast they have 2sqm footpath slabs in a standardised design. We have that up and down our street too, but Chorus has been in the local paper saying it will all be taken care of at the end. The patch outside the neighbours driveway has been dug up and relaid three times in the last two weeks. Last week it had a river of water pouring out of it, so who knows what they managed to do then. On Friday 17th I received an email from Spark to say the updated appointment had been set for 24 Sept PM. I can't be at home for that afternoon so I logged onto the site to change the date but each time I selected a date it returned an error message "That's embarrassing....blah blah". So I jumped on a chat session, explained the situation and had it changed to 28th PM. About an hour later I received an email to say it had been updated to 28th PM. Four hours later another email arrives to say it's been rescheduled back to 24th PM. This morning I received a text confirming 24th AM (it's never been AM until this point) and if I would like to change it to reply with "2" and someone would be in touch. That I did, but needless to say that hasn't happened. How hard can this be ? Makes me glad our fibre is being looked after by NorthPower here in Whangarei. Never had any issues with clients we've refered to get fibre installed, and haven't heard any horror stories from those on fibre, that I've spoken to over the years. Had more SMS today with the install stated as 24th AM. Talking to Spark now and they say it's definitely 24th PM but Chorus aren't ready to install yet as there are still problems outside the boundary which need to be fixed first. I wonder how many people take days off and no-one turns up and how many times Chorus turn up but can't do anything because no-one is at home. To make you feel better, I only just got Fibre sorted after 10 months of shinanigans. - First guy was named Harry and did the initial consult, the work needing to be done was straight forward apparently. Cable off telephone pole, across the lawn verge of front property, microtrench down seam in driveway, behind shed, under deck into ETP then into ONT. - Several months later, same guy rocks up to start work. Reckons its going to take a while so books Saturday morning from 7.30. Rocks up at 9 and says it needs to be rescoped etc and that it will need a new plan to be approved. - Get a text if I could be home on a Tuesday so work can be done with new plan. Work from home, they arrive late again but get everything ready. Hour later he comes to door saying he needs a more robust ladder for health-safety reasons. - Month or so later, rebooks and turns up. Says the cable run will be longer than 105 meters so it needs to be re-scoped yet again. Never hear from him again. - Two weeks ago, another team turns up saying build has been completed and they're there to connect ETP to ONT. Extremely pissed off to find out that wasn't the case. Top blokes, ask me how I wanted it done so talk them through the original build discussed. They submit it again, gets approved, they turn up at 4pm the next day after chasing approval, dig micro-trench. Turn up the next day and close out the job and install the ETP and ONT. So eventually got UFB after ordering last November. Loads and loads more screwing around than detailed above, probably had 10 visits from first guy with a new excuse each time he got me to be there either on a work day or weekend plus loads more contact. Got a text from MyRepublic yesterday to say Chorus will be onsite on the 26th to scope out the work to be done so I'm looking to offload them as they've been useless throughout the whole debacle. Looks like the Chorus contractors who are doing the OPs install were trained by Telecom. My original fault saga that happened in BC times (before Chorus). Line fault - no dial tone and slow ADSL. Verify that there is no internal wiring faults and then lodge a fault. Repeat above process approx 10 times until Telecom finally sends out a tech who manages to finally trace the fault. Fault was the wires in the direct buried leadin shorting to eachover, but without any earth leakage faults. Approval finally granted for a new leadin to be installed. And the tech installed a temporary cable. Came home a few weeks later and a piece of green conduit was poking out of the ground on the side of the house. In a completely different location to where the line enters the house. The temporary cable was gone, yet the wire poking out of the green conduit had not yet been connected at the other end. No internet until another tech was able to come and connect the other end. All done with no consultation or warning. It was extremely lucky, that the tech just happened to pick a spot that backed onto the cupboard under the stairs. Which is the perfect location for the modem. 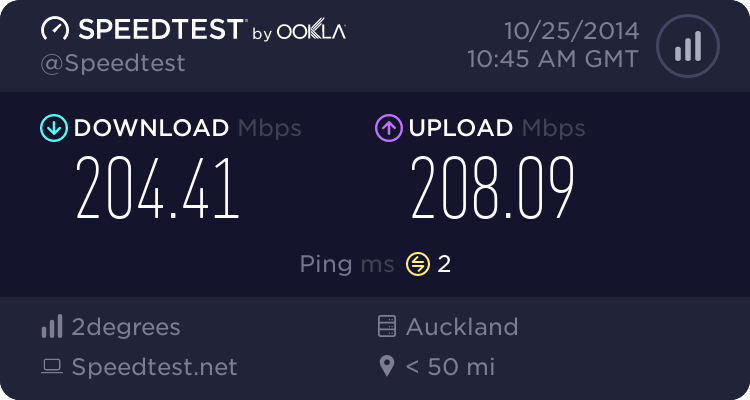 And when UFB arrived, the install was a breeze. Both for me and the fibre installers. I had the equivalent of a nightmare new copper install. And a quick, easy UFB install. Exactly 1 week between ordering UFB and UFB all installed and working. While it took months between reporting the first fault, and finally getting the copper fixed properly. 1pm on 28th rolls around and Chorus turn up telling me they are going to fix the faults outside the house, install the ETP and also the ONT. "Yeah, ok" I said and left them too it. They dug up the garden again and dug up the road again and by 3pm there were three vans and six people out there all scratching their heads. 6pm comes and goes and eventually they knock on the door to say they still can't get the fibre from up the road and they will be back. I tell them we are going away for a week and wish them luck. The next day I receive an email to say we can claim a free six months of Netflix for having changed our plan. I'm on holiday so I ignore it. But we get back to find no internet, the kids have had no wifi for a week and are hanging out for it !! I notice there are no DSL lights on the modem, so reset it, then log into it and see it's been down since 29th. I log into MySpark and see I was moved to a Fibre plan on Saturday 29th !! So I get on the chat session with Spark, they have no idea what's happened so log a fault and tell me it could be 48 hours before I see anyone. I ask to have some data added to my SIM card so I can hotspot with my phone and they agree. That was 36 hours ago. I've chased the person I spoke to via email and have had no reply. MySpark just tells me the fault has been assigned.